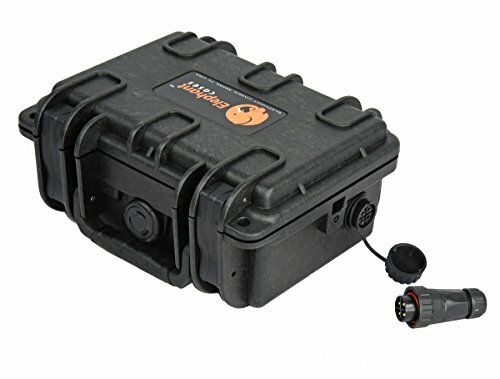 Elephant K095 Custom Battery box - Battery Case , (Battery not Included) Will fit 12V-7Ah Sealed Led acid batteries or Lithium Batteries with a size of 5.9" x 2.6" x 3.7". Great case to power a fish finders,LED lights, GPS etc..., Comes with one 3 amp and one 5 amp fuses. Elephant K095 Case Includes : 1- Female waterproof IP68 Marine Grade 4 pin polarized Connector, 1- Male waterproof IP68 Marine Grade 4 pin polarized Connector, 2- Marine grade watertight Fuse Holders, 1- 2 amp Fuse for delicate equipment like fish finders etc..., 1- 5 amp Fuse for anything else like lights etc... 1- Battery Holder Plate 1- solid bottom foam. 1-top egg-crate foam Specifications: Ext. Dim: 8-5/16" x 7" x 4-1/8" (LxWxH) , Interior Dimensions 7-1/2" x 4-7/8" x 3-1/2" (LxWxH) Material : Fiber Reinforced Polymer (FPR) AKA "HARD PLASTIC" Working Temperature : -40 to 194F Features: *Waterproof, Dust proof, Crush proof, High Impact resistant, Corrosion resistant, UV resistant, Extreme Temperature Resistant, heavy Duty Latches, Fold down handle, Automatic Pressure release valve, stainless steel hardware, 30 days Limited Warranty from Off Road Specialty. Waterproof Marine Grade IP68 4 pin Polarized connectors (25A), connectors are waterproof even when cap is off. Dual watertight marine grade Fuse holders with one 3 am and one 5 amp fuses included. Can fit through a 8" round Hatch or bigger. Deluxe Molded Foam Kayak Seat with detachable back packs. Kayak Fishing Seat. Backpack comes with 2 rod holders.